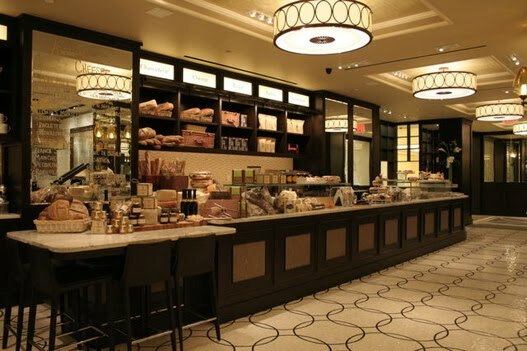 Earlier this summer, The Plaza Hotel introduced a new culinary attraction for city foodies: The Plaza Food Hall. 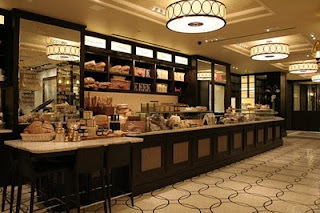 Conceived by Chef Todd English, host of the PBS show Food Trip with Todd English, the upscale food court is a European-style market offering an extensive array of stands. It’s large by New York City standards – 5400 square feet – and takes a bit of searching to locate in the concourse level of the hotel. With Executive Chef Mike Suppa, English has created a panoply of choices for anyone of any age: seafood at The Ocean Grill & Oyster Bar, Asian-American at the Dumpling Bar, a Sushi Bar, and The Grill with a something-for-everyone menu of burgers, steaks and salads. If that isn’t enough, there’s a bakery, a cheese and charcuterie counter, a wine bar with tapas, and a stone hearth pizza oven. And, yes, cocktails are served, too. Guests enjoy all this in the spacious 80-seat space, complete with marble counters and a mosaic floor that create a European food-hall ambiance. Prices are a moderate $10-$30 per meal. Takeout goodies are equally enticing with coffee, teas, jams, spices and sauces all for purchase. Just in time for Central Park’s free movies week, you can buy a Food Hall picnic basket too loaded with your gourmet faves. 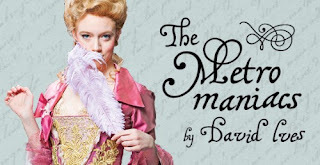 The Plaza Hotel, 768 Fifth Ave. (at Central Park South), open 7am-10pm Sunday –Thursday, 7am-11pm Friday & Saturday. 212-986-9260. 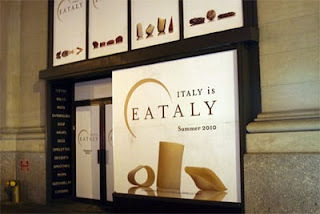 Eataly, restauranteurs Joseph Bastianich and Mario Batali's newest humongous 50,000 (approx). square foot food venture, opens August 31 on West 23rd Street near Fifth Avenue. Watch for details.